Thank you for your interest in providing Long Meadow Landings residents with a special discount on services and/or products from your business. This is a great way to market your business to our local community. It's easy to get started! Simply fill out and submit the form below. 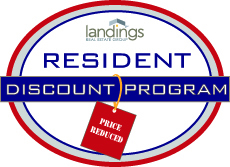 A member of the Long Meadow Landings team will review your discount and post it on our Find A Discount page. Please be sure to fill in all of your contact information correctly, so if we have any questions we can contact you. For more information on this great program you can contact us at 860-446-9171. Please use this space to give a detailed explanation of the discount you with to offer.